Tactic: Use the social data in EverTrue to identify your most engaged donors who have yet to be assigned to a gift officer. Start with all your constituent records, then add filters. Use the “Is Donor?” filter and set it to “Yes,” then look for the “Assigned?” filter and set it to “No.” You’ll then generate a list of all people who have given to your organization in the past but are yet unassigned. From here, you can add additional filters to continue narrowing down the list. Look for social engagement, recent gifts, or capacity indicators such as job title or neighborhood to find the best potential prospects.This search also works in different regions. 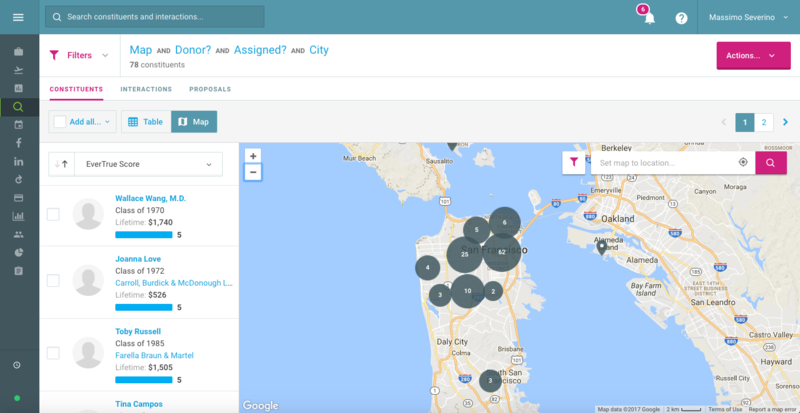 Use the map feature to hone in on a specific city (say, San Francisco or Hong Kong), add the “Is Donor?” and “Assigned?” filters and then continue digging from there. Here's the map view of unassigned donors living in San Francisco. Results: Build portfolios for gift officers with prospects that have the best capacity, engagement, and giving history possible.